Thanks to the support of the City of Geneva and of the Republic and Canton of Geneva, a side event titled « From mob justice to prison overcrowding: the importance of a good administration in Togo » was organized by the International Catholic Center of Geneva (CCIG), the International Federation of Action by Christians for the Abolition of Torture (FIACAT) and the Action by Christians for the Abolition of Torture in Togo (ACAT Togo) on Wednesday, September 13th, at the Palais des Nations, in conjunction with the 36th session of the Human Rights Council. Co-sponsored by the World Organization against Torture (OMCT) and by the Center for Civil and Political Rights (CCPR Center), the event gathered panelists from civil society from the ground and from Geneva, as well as a UN expert. The panel discussion was moderated by Ms. Maria D’Onofrio, Secretary General of CCIG. 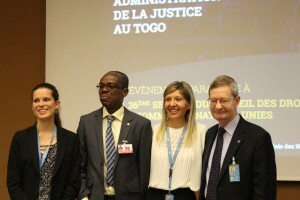 The event raised the issue of the length of penal procedures in Togo leading to excessive preventive detention, which contributes to prison overcrowding. The first panelist, Mr. Franck Gafan from the Young Men’s Christian Association Togo (YMCA Togo) listed the insufficient resources for judges and the lack of detention facilities among the causes of prison overcrowding in Togo. According to official statistics, the overcrowding rate can reach up to 379% in the prison of Tsevie, while the new detention facility of Kpalime (with a capacity for 161) hosted 314 detainees already in December 2016 – three months after its opening – presenting an overcrowding rate of 195%. Speaking of the conditions of detention, Mr. Gafan mentioned the great difficulties experienced by persons deprived of liberty in accessing adequate food, health care and sanitation, which increase the risk of epidemics. Second to take the floor, Ms. Marie Salphati from FIACAT addressed the worrying increase of mob justice, the public revenge of victims against perpetrators. This phenomenon seems to be mostly due to a lack of knowledge of the law and a decrease of trust in the judiciary system by the population. Mob justice can generate diverse human rights violations, including the perpetration of acts of torture as well as violations of the right to life, the presumption of innocence and the right to a fair trial. It has to be dealt through joint interventions of the government and civil society actors. Finally, Mr. Alessio Bruni, member of the UN committee against torture, reported the main conclusions stemming from the review of the second report of Togo led by the Committee in 2012. While acknowledging the active participation of the State in the review and afterwards the positive achievement of the adoption of the new criminal code, Mr. Bruni noted that several recommendations of the Committee are still to be implemented. He also stressed the urgency to adopt the new code of criminal procedure in order to provide the judiciary with all needed tools to accomplish its mandate in the most effective way. Following the panelists’ presentations, the State’s representative of Togo also took the floor and stressed the will of Togo to improve its judicial system as well as address prison overcrowding and other issues related to preventive detention. He also stressed how the delay in improving the detention conditions is mainly due to the lack of resources. Finally, he ensured the commitment of the State to fight against mob justice by increasing the number of police officers, launching raising-awareness campaigns and ensuring that perpetrators are brought to justice. He concluded by reaffirming the State’s willingness to work along with NGOs to address the issue and raise awareness among civil society. To read the full report on the event, including links to panelists’ presentation, click here for French, or click here for English. A video including testimonies from participants of the event coming from the field is available in English and in French. No Comments to "CCIG event : The importance of a good administration of justice in Togo"